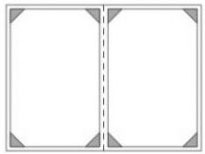 The Double Menu Cover is a classic choice for many restaurants and cafes. Versatile design options mean these menus can be customized to complement any decor. With two full panels that securely hold two reading pages, this is an understated, handsome option that offers durability and value. Submit our online form to recieve a quote. If you would rather talk to someone in person, please contact Rolex Plastics at 1-888-478-5553 and mention BC Menu Covers. All of your personal information will be kept confidential.